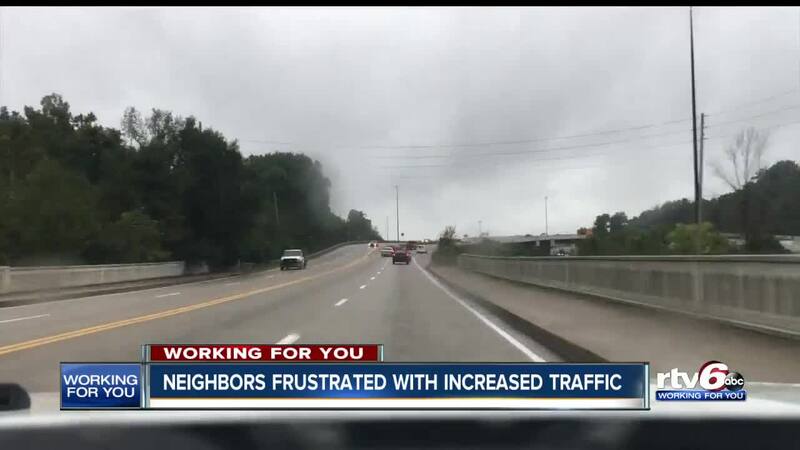 Neighbors frustrated with increased traffic in their neighborhood have funded a traffic study to bring to the state's attention. INDIANAPOLIS -- People in a northeast-side community say drivers are speeding through their neighborhood streets to access I-465. RTV6 first visited the area in August, when neighbors put out signs asking people to slow down. Now, the community is working on a traffic study, to find out just how many cars travel through the area. The Devonshire Three and Six Civic Association paid about $1,000 for the study, which showed that about 1,500 more vehicles travel in the area than they expected. "I think the entire board was surprised," said Ron Taylor, the president of the Devonshire Three and Six Civic Association. "The engineers are telling us that we should expect about 250 trips per day on [Brokenhurst Road]. What we've seen is about 1,800." The study is being conducted by Yarger Engineering. It also found that one in two vehicles go faster than the posted speed limit of 30 mph. "We anticipate the city will have to verify the count but we don't anticipate they would have to do a separate study now," Taylor said. But that may not be true. A spokesperson for the Department of Public Works said the study isn't necessarily helpful because it would need to be independent of neighborhood bias. Taylor also wants to address why the drivers are cutting through. "There's a semi on a neighborhood street and that's not totally uncommon - that truck is probably trying to work it's way to 465," Taylor said. Vehicles may be cutting through because just northeast of the neighborhood at the Binford/I-465 exit, there is no way to get on I-465 East. "They'll cut through this neighborhood or one of the other neighborhoods to get to Fall Creek, which takes them over to the Shadeland Exit - that's the way to get on [I-465 East/South]," Taylor said. INDOT has released early designs for its "Refresh I-465" project, which would modify the Binford/I-465 interchange, but none of the early designs show an I-465 East exit. Taylor hopes to change that. "We have lots of people who are active and running and out riding their bike and it makes it just dangerous," he said. RTV6 has reached out to INDOT for comment, but we have not heard back.